After 782 miles and eight days of racing, 23 year-old Julian Alaphilippe (FRA) of Etixx – Quick-Step Pro Cycling Team clinched the 2016 Amgen Tour of California championship, becoming the youngest rider to hold that title in the race’s 11 years. U.S. National Road Race Champion Megan Guarnier (Glens Falls, New York) of Boels-Dolmans Cycling Team also celebrated victory in Sacramento as the four-day Amgen Breakaway from Heart Disease™ Women’s Race Empowered with SRAM which concluded along with the men’s event. 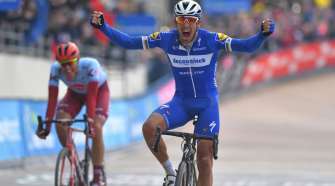 After ceding last year’s race to Tinkoff’s Peter Sagan (SVK) by a mere three seconds, a determined Alaphilippe earned the traditional yellow Amgen Race Leader Jersey with a solo victory on the Gibraltar Road Queen Stage (3) Tuesday and has successfully defended it every day since, with a 16-second advantage at today’s start that he grew to 21 seconds when all was said and done. This first stage race win of his young career may foreshadow more headlines on the horizon with what would be his Grand Tour debut if he’s selected for his team’s Tour de France squad this summer. Today’s Sacramento course took the 133 world-class cyclists on a 85.7-mile jaunt including a crossing of the iconic Tower Bridge leading into three 2.2-mile laps around Capitol Park to the finish line in the shadow of the Capitol Building. 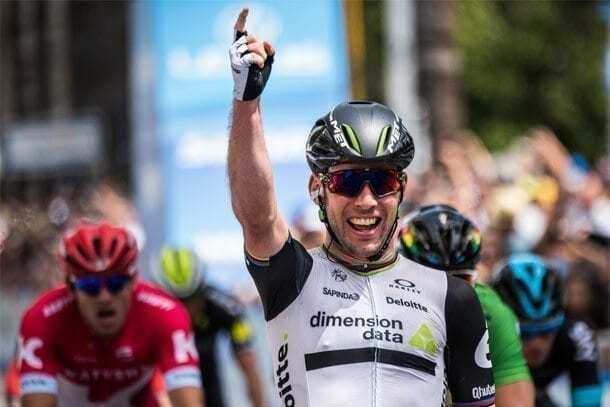 Team Dimension Data for Qhubeka’s Mark Cavendish (GBR) came away with a hard-earned victory after an epic sprinter showdown, claiming his tenth all-time Amgen Tour of California stage win, second only to Sagan who holds the race record with 15 after taking Stages 1 and 4 this week. Out on today’s course, an early breakaway of seven held until the closing circuits. Etixx – Quick-Step, protecting their yellow jersey winner, and Team Dimension Data for Qhubeka, looking for the stage win, took turns patrolling at the front of the peloton and had pulled the gap back to one minute with about 25 miles left to ride. The peloton with Tinkoff in control bore down on the leaders coming into the circuits, bringing the gap to less than 45 seconds. 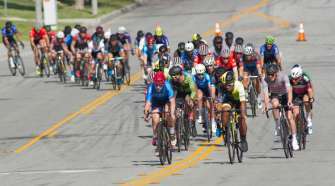 The leaders were finally swallowed in the final lap, with the world’s all-star sprinters lining up to face off for a fast finish, including Team Dimension Data for Qhubeka with Mark Cavendish (GBR) on the wheel of his lead-out man Mark Renshaw (AUS). Also near the front as the peloton hurtled toward the finish at speeds in excess of 30 mph were Tinkoff with World Champion Sagan, and Team KATUSHA with star sprinter Alexander Kristoff (NOR), fresh off his stage win yesterday. Even Alaphilippe joined the final flurry to the finish where Cavendish delivered his tenth Amgen Tour of California stage win (second only to Sagan), followed over the line by Sagan himself then Kristoff. Team Sky’s Danny Van Poppel (NED) took third yesterday and settled for fourth today, followed by Team Giant-Alpecin’s John Degenkolb (GER), who has had a strong showing in California as he comes back from a severe injury after a car hit several team members during a training ride in January. Cavendish, who holds a near record of 26 stage wins at the Tour de France, won four stages last year at the 2015 Amgen Tour of California, including several neck and neck finishes with Sagan, to claim last year’s Points classification. Today marks Cavendish’s fourth stage win in Sacramento (2010, 2014, 2015, 2016) including another close finish over Degenkolb in 2014. 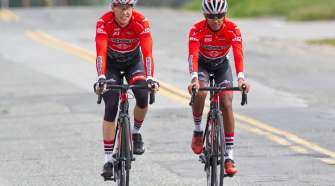 In the classification competitions, the Lexus King of the Mountain (KOM) award for the week went to a rider familiar with the Sacramento-area terrain, Rally Cycling’s Evan Huffman (Elk Grove, Calif.), after what was one of the most mountainous of all the Amgen Tour of California editions. In addition to his World Championship title, Sagan (SVK) has racked up Points classification wins at the Tour de France (4) and will take home his career sixth Amgen Tour of California Visit California Sprint Jersey with the classification win this year. The SRAM Best Young Rider Jersey went to the Sacramento-area 19 year-old Neilson Powless (Roseville, Calif.) of the Axeon Hagens Berman Cycling Team, who has worn the jersey and been in the top-5 overall for much of the race, finishing in ninth overall after today. Toms Skujins (LAT) of Cannondale Pro Cycling Team (USA) was the Breakaway from Cancer® Most Courageous Rider. Reigning U.S. National Road Race Champion Megan Guarnier (Glens Falls, New York) seized the race lead in South Lake Tahoe on day one of the Amgen Breakaway from Heart Disease™ Women’s Race Empowered with SRAM and has held onto it ever since. After four race days and a total of 197.8 miles, she began the day with a 15-second advantage, and goes away as the 2016 women’s race champion following a 41-mile circuit race (20 laps) around Capitol Park in Sacramento. Guarnier also won the overall Points classification, and will go on to represent the U.S. in the Rio Summer Olympic Games in August. The field of 91 starters in the UCI Women’s WorldTour event lost a few riders to crashes on the fast and flat course. After a couple of short-lived breaks, Cylance Pro Cycling showed strength at the front of the peloton as the riders crossed the finish line again and again during their circuit laps. With two laps to go, UnitedHealthcare Pro Cycling Team took over at the front in hopes to propel 2014 U.S. National Criterium Champion Coryn Rivera to a win. It was not enough to hold off Hitec Products’ Kirsten Wild (NED), who came over the finish line just ahead of Canyon/SRAM Racing’s former German National Champion Lisa Brennauer and Rabo-Liv Women Cycling Team’s lauded rider Marianne Vos (NED). Rivera, who placed second at yesterday’s Santa Rosa stage, was fourth today, with Wiggle High5 Pro Cycling’s Amy Pieters (NED) in fifth. At the conclusion of the women’s event, two Boels-Dolmans riders stood on the overall podium with Guarnier taking top honors and teammate Evelyn Stevens (Claremont, Calif.) in third. Four-time National Time Trial Champion and two-time Olympic gold medalist Kristin Armstrong (Memphis, Tenn.) of TWENTY16 – Ridebiker placed second. Mara Abbott (Boulder, Colo.) of Wiggle High5 Pro Cycling came away from the competition with the Lexus Queen of the Mountain (QOM) Jersey. The SRAM Best Young Rider Jersey went to 19 year-old Chloe Dygert, the two-time Junior World Champion from Bremerton, Wash., and Rabo-Liv Women Cycling Team’s Shara Gillow (AUS) was named the Breakaway from Cancer® Most Courageous Rider. NBC Sports Group will present a comprehensive highlight show featuring robust coverage of the women’s race on Thurs., May 26 at 10:30 p.m. PDT / Friday, May 27 at 1:30 a.m. EDT on NBCSN. Race fans can find results, recaps, videos and photos from both races via the Microsoft Tour Tracker App and at amgentourofcalifornia.com.